It’s unfortunate, but somebody has to say these things. The March for Science was stunning in the size of the turnout, yet equally stunning in the lack of a message. No one wants to say this, but I will. 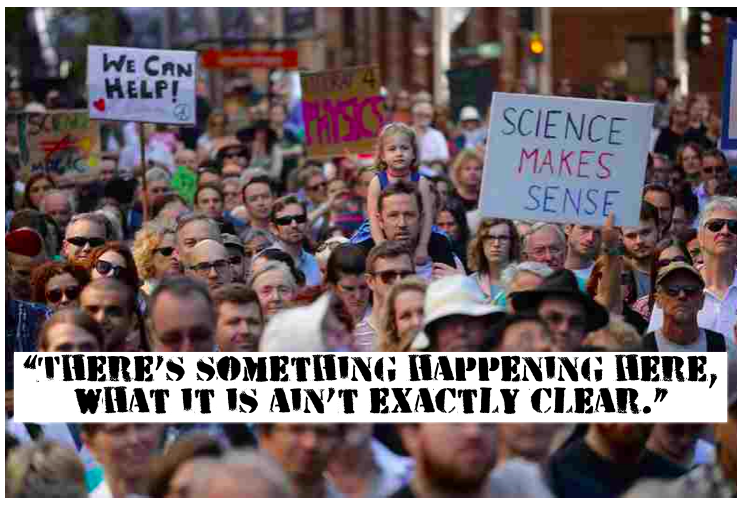 The message is, “There’s no leadership in science.” The march wasn’t the doing of the science “leadership” — it was organized by “the troops.” I discussed this on NPR on Friday. An absence of leadership wasn’t a problem in the 1950’s, but it is today. WHAT DO WE WANT? SOMETHING! WHEN DO WE WANT IT? SOMETIME! On Saturday I took part in the March for Science in Washington DC. The turnout, despite heavy rain, was stunning and inspiring. It hit me at the gut level — both humor and emotion. Clearly there is a ton of good will at the grassroots level of the science world. But there’s a problem. The leadership is lacking. I’ve been hitting this note for years and even mentioned it in my 2015 book, “Houston, We Have A Narrative.” It bothered me in the 1980’s when I was a scientist. The profession is run by faceless committees. Which was fine in the pro-science 1950’s and 1960’s, but we’re now in a different era. It’s a problem. I was on NPR on Friday talking about, “the message” of the March for Science. There was no message. Actually, as Ed Yong identified, there were at least 21 “messages.” But in a world of too much information, that ends up resulting in their being no overall message. The absence of a message on Saturday was abundantly clear. It started in January when the march first arose, not from the ranks of leadership, but from the grassroots level on Reddit. I was on the periphery of the communications team since near the start. They never managed to decide on whether the event was a politicized anti-Trump rally or a happy fun science festival day for the family. It ended up being sort of both, and also neither. The absence of a message was most apparent on the website where they never did post any sort of slug line or slogan within the artwork. The closest they had was, “Science, Not Silence” (I dare you to say that ten times fast). 2 NO MEDIA TRACTION – coverage of the march was ephemeral and kind of trivial. The main focus was all the funny signs and science puns. But there was no clear message. Having a message, means having a narrative, which is what the media world feeds on because “media is narrative” as I said in my Friday talk at the Earth Optimism Summit. THE MESSAGE: WHERE’S OUR LEADERSHIP? Q: What is the official policy of the science world on debating anti-science people? Right now the American Psychological Association is doing a good job telling psychologists to remember The Goldwater Rule (to not publicly evaluate the mental health of politicians in office). That is leadership. But for the science world, trying to stop CNN from including climate skeptics in their climate “debates” seems to fall on peripheral entertainers like Bill Nye. In 2010 I blogged the recommendation that no one other than comedians debate climate skeptics, but that was just me, not the appointed “leadership” of the science world. This was the title of my talk on Friday. It’s my message for 2017. It’s what I spoke about to James Carville’s class at Tulane University in January. It’s what I’m preaching now through our Story Circles Narrative Training (which will launch 6 circles next month with National Park Service in Colorado!). I spoke with a friend yesterday who is a geologist. She told me that only 10 of the 52 member organizations of the American Geosciences Institute (the big umbrella group for geology) supported the march. The others were “put off” by the political tone of the organizers. Which just confirms the predicament. There is no clear leadership for the profession of science. And that’s a problem, given the anti-science tone of the current administration. I’m not sure what the solution is, but the one thing I know well is that everything has to start by identifying the problem. Everyone seems to think “the problem” is Trump. But I feel there’s a deeper problem, which is the absence of effective leadership with which to defend the profession. It’s not the end of the world, but is definitely something that needs to be addressed.